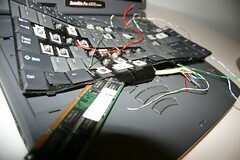 Home » Techno » PC breakdowns – why drag your PC to the repair store? PC breakdowns – why drag your PC to the repair store? Ever had your PC break down and had to lug the thing to the nearest (or not!) pc repair store? I know I have, many times. It’s surprising that we still have to do this but the range of problems is quite extensive! All of these problems cut into your productivity to say the least! It would be nice to have computer service at your home. Just call a technician who comes promptly (ie. within a few hours) and who can diagnose the fault, and repair it or replace it as necessary. Wonder if someone will come and replace the dying battery in my motherboard?… I forgot to get it replaced last time I had to drag my monster PC to the store, and every day I have to reset the time and date. Very annoying! How much would that be, not including the airfare?